THIS EXTREMELY SMALL PLATFORM WILL CARRY AN ENORMOUS 50-POUND ( 23 KG ) LOAD. THIS IS A PETITE DESIGN, BUT IT IS NOT A TOY. ITS ROBUST CONSTRUCTION USES A ONE HALF-INCH (1/2", 12.7 MM ) THICK ALUMINUM PLATE. THE OVERALL HEIGHT OF THIS KINEMATIC PLATFORM FROM THE BASE TO THE TOP IS ONE AND ONE EIGHT INCHES (1 1/8", 1.125", 28.6 MM). 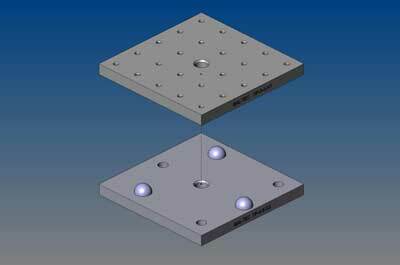 IN STAYING WITH AN INDUSTRIAL DESIGN, THIS PLATFORM USES THREE LARGE, THREE-QUARTERS OF AN INCH (3/4", 19MM) DIAMETER SPHERES ON THE LOWER PLATFORM. 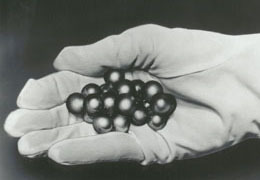 THESE SPHERES ARE NOT ORDINARY COMMERCIAL STEEL BEARING BALLS THAT ARE PRONE TO RUST AND VERY SUSCEPTIBLE TO FRETTING. OUR SPHERES ARE MADE OF EXTREMELY FINE-GRAINED, HIGH CHROME, HIGH CARBON, STAINLESS STEEL, THAT IS HARDENED TO 58 HRC MINIMUM. 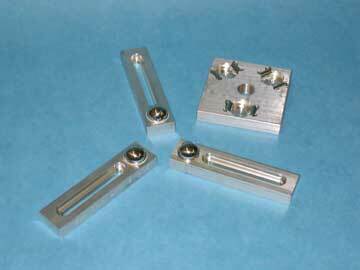 THEIR SPHERICITY AND SURFACE QUALITY ARE PRECISION LAPPED TO AFBMA INSTRUMENT QUALITY GRADE 10. THIS QUALITY PROVIDES REPEATABILITY THAT CAN BE ORDERS OF MAGNITUDE BETTER THAN THE CONVENTIONAL COMMERCIAL PRODUCT. 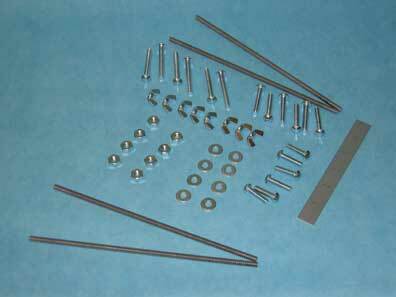 THIS CONTRASTS WITH COMMERCIAL DOWEL PINS THAT ARE USED IN COMPETITIVE PRODUCTS. THESE GROUND ONLY CARBON STEEL DOWEL PINS ARE PRONE TO RUST AND ARE VERY SUSCEPTIBLE TO FRETTING, WHICH IS ONE OF THE MAJOR PROBLEMS, OF KINEMATIC COUPLINGS.